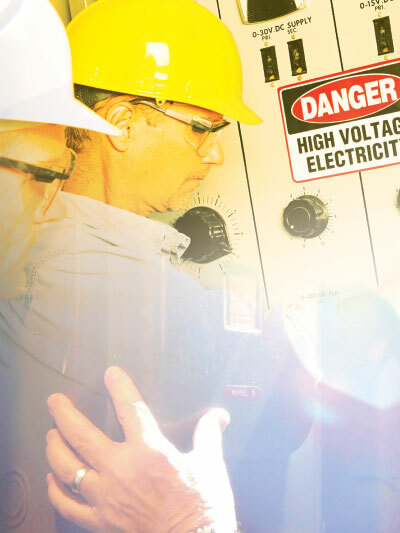 Direct current (DC) arcing fault incident energy calculations are presented to assess the level of risk involved when working around high current DC apparatus. The proposed procedure allows evaluation of incident energy and arc flash boundaries, while taking into account as many circuit parameters as possible. These parameters include fixed or variable gap length, system voltage, available fault current, equipment configuration, circuit time constant and evaluated threshold energy for a second degree burn. where tarc is the arc duration and D represents the distance from the arc. This formula assumes the radiant heat transfer. Not all of the arc energy will be transferred as radiant heat 2 especially within the short time interval after the arc was ignited. Therefore, the Equation (3) will produce a conservative but safe estimate of incident energy exposure. For the arc in a box, the enclosure has a focusing effect on the incident energy. For the selected enclosure type and test distance,3 the incident energies calculated for enclosures are 2.2 times larger than the incident energies calculated for open air. Figure 1. 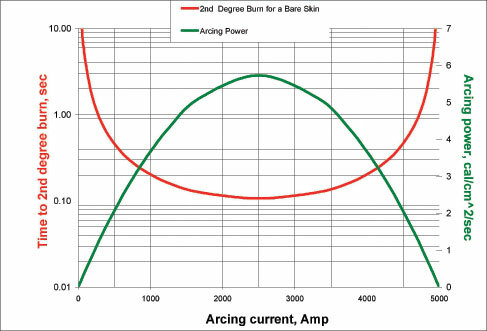 Sample arcing power and time to 2nd degree burn vs. arcing current at 0.5 meter distance away from arc in open air 600 VDC system. This creates a dilemma due to the fact that one cannot determine the arcing time without the RMS value of the arcing current, and one cannot solve for the RMS current without the arcing time represented by the n term in Equation 9. This requires an iterative solution. As a first approximation, begin by assuming that Irms equals Iarc, determining tarc from the analytical expression for the fuse T-C characteristics tarc=f(Irms), determining the number of time constants n and calculating K from Equation 9, substituting its value into Equation 8 to calculate the new RMS current, and then solving for the arc duration again. Once the first approximation of the arc duration has been made, determine the new number of time-constants n, re-calculate the K term and substitute its value into Equation 8. This produces a new Irms. Re-calculate for a new tarc by using the new Irms and continue until the answers converge. Then, Equations (3) through (5) can be utilized to complete the DC arc analysis under the transient conditions. Figure 2. Simplified block diagram for resolving arcing faults in DC power systems. With numerous variable parameters on hand, which results in the difficulty to accurately model DC arc and to predict the arc V-I characteristic and thermal behavior, we decided to consider the worst-case scenario leading to an arbitrary burn hazard in the shortest possible time. Figure 1 shows arcing power as a function of variable arcing current for the DC equivalent circuit described by Equation 1. The red line on figure 1 represents time to 2nd degree burn as a function of heat flux.4 Note that the minimum time to 2nd degree burn, as well as any other burn hazard, coincides with the maximum power released by an arc, hence, the maximum heat flux. where Eb is equal to 1.2 cal/cm2/sec. The Equation (10) assumes rectangular flash pulse, thus producing the minimum time to 2nd degree burn under the specified circuit conditions. It can also be applied for hazards other than 2nd degree burn by selecting a different Eb factor on the right side of the Equation 10. When analytical expression for the protective device clearing the fault time-current characteristic is available, it is possible to examine power and energy released by an arc as a function of arcing current and arc resistance, and to determine maximum damage that can be caused by the arc during the selected time interval. A simplified block diagram on figure 2 describes the proposed approach for calculating incident energies and for determining arc flash boundaries in DC power systems. With a better understanding of the DC circuit parameters and the DC capabilities of fuses, modeling DC arcs and selecting appropriate fuses for mitigating arc-flash hazard can be accomplished without much difficulty. The generalized solution presented in this paper considers the worst-case scenario, effectively eliminating the need for accurately predicting arcing gap and arc resistance. 1 “Electric Arcs and Arc Interruption.” C.E. Sölver. Chalmers University of Technology. February 2005. 2 “Electric Power Transmission Systems.” 2nd Edition. J. Robert Eaton, Edwin Cohen. Prentice-Hall, Inc.
3 “DC Arc Models and Incident Energy Calculations.” R. Ammerman, T. Gammon, P.K. Sen, J. Nelson. IEEE Transactions on Industry Applications, Vol. 46, No. 5, September/October 2010. 4 “Evaluation of Onset to Second Degree Burn Energy in Arc Flash.” M. Furtak, L. Silecky. Electrical Safety Measures, March/April 2012. 5 “Arcing Faults on Direct Current Trolley Systems.” P. Hall, K Myers and W. Vilchek. Mine Safety and Health Administration. 6 “Fuse Protection of DC Systems.” Cynthia Cline. Annual Meeting of the American Power Conference. April 1995.